The RDA consists of four bodies: RDA Council, Secretariat, Technical Advisory Board, and Organisational Advisory Board. These bodies, and the relationships between them, are described in the RDA Governance Document. The RDA Council is responsible for the oversight, sustainability, and overall success of RDA including the approval of candidate Working and Interest Groups to ensure alignment with RDA goals. The Council’s roles and responsibilities are described in the RDA Governance Document. The Council has nine members, including two Council co-chairs. For more information on Council, including the Council members and their profiles, please see the RDA Council page. 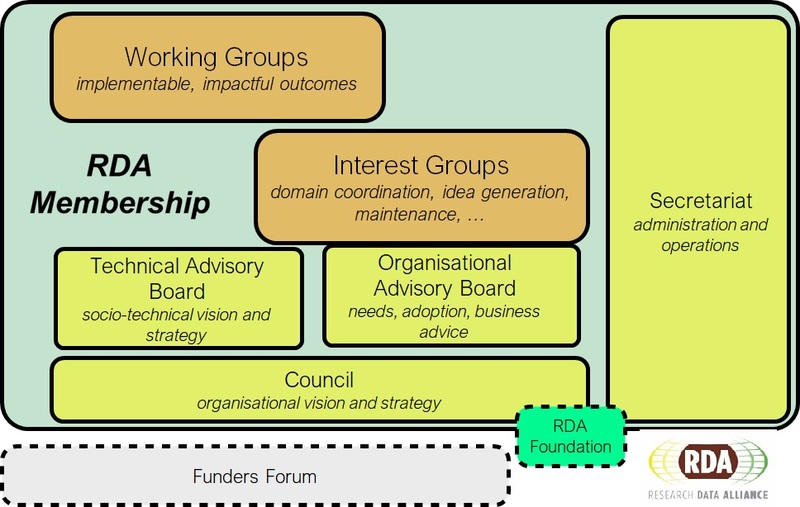 The RDA Funders Forum, initiated around the launch of RDA in 2013, is a group of funding organisations / representatives with an interest in research data and related data policies. Participation to the Funders Forum is not limited to current funders of RDA, but is open to all funding agencies and organisations with an interest to attend. For more information on the Funders Forum, please see RDA Funders Forum page. The Technical Advisory Board (TAB) is responsible for the technical direction of RDA and provides technical expertise and advice to RDA Council, as well as helping to develop and review RDA Working and Interest Groups to promote their impact and effectiveness. TAB is also responsible for the development, maintenance, and evolution of the RDA Technical Roadmap. A TAB co-chair serves as an observer member of the RDA Council. The procedures which govern TAB membership and activities are described in the TAB Responsibilities and Processes document. For more information on the RDA TAB, including the members and their profiles, please see the RDA TAB page. The Organisational Advisory Board (OAB) is composed of representatives of the Organisational Members also known as the Organisational Assembly (OA). The OAB advises Council on the directions, processes, and mechanisms of RDA. A co-chair of the OAB serves as an observer member of Council. The procedures which govern OAB membership and activities are described in the Organisational Membership Process Document. View the list of Organisational members and meet their representatives. General RDA operations and administration are conducted by the internationally distributed Secretariat. For more information on the Secretariat, including the members and their profiles, please see the RDA Secretariat page.